My friend Alice and I are huge fans of flavored vodka and Crystal Light (or the imitation brands which are just as tasty and calorie free). My concoctions are usually "half and half", half vodka and half water, straw required. After a couple of drinks, a nice buzz kicks in. The alcohol content resembles a martini, but we can't call it a martini since we leave the ice in the glass to help curb the bite. We were at our friend Chuba's birthday party and she brought over Pinnacle Swedish Vodka to share. It was love at first sight! I do like to try different flavored vodka's but I haven't seen the swedish fish flavor. Due to copyright issues, the actual name of the vodka is Pinnacle "Gummy" with a picture of the swedish fish on it. She made me a few drinks using the swedish fish flavored vodka and the Target brand cherry lime powder mix. I was hooked! I loved it so much that I handed her a $20.00 bill at the end of the night and took the leftover vodka home with me. Here I am on a Thirsty Thursday night making my own rendition of the drink. I'm feeling a bit fancy, so I am making a martini instead. 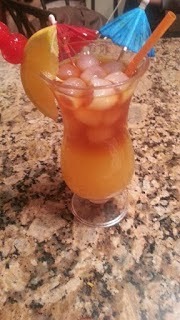 I'm using the same drink recipe but adding a splash of Pinnacle Cake flavored vodka for extra sweetness. I actually use my protein shaker to make martinis because it doesn't leak and the cap is easy to remove. It also has a metal ball that mixes the powder really well. I love my original martini shaker but it can be hard to remove the cap at times.